Koh Samui is one of the loveliest of Thailand's islands and is a favorite destination for travelers from around the world. The island is the second largest of the island chain after Phuket and has sandy, white beaches, crystal blue water, and mountains that offer panoramic views of the lush scenery. The island is in the Gulf of Thailand, in proximity to Bo Pud Beach. Tourism is the island's major industry on Koh Samui. Visitors often travel to the island for extended stays of a month of more for the climate, the pristine beaches, and the relaxing atmosphere. Koh Samui is a world-class vacation destination for individuals, couples, and groups. Whether your idea of a holiday is sunbathing on the beach, touring local attractions, shopping, or nightlife, the island has something for everyone. Bangkok Airways has flights going to Samui Airport, an international facility. Since the airport's upgrade to a customs facility, direct flights from Southeast Asian cities fly into the island. New passenger terminals and amenities including restaurants and a spa are at the airport. The new terminal is open-air and enhances the natural environment. Samui Park Avenue features a selection of upscale shops, cafes, and restaurants. The venue is used for cultural exhibits and music events. The Boutique Lounge offers cold drinks and snack food and is complimentary for all Bangkok Airways passengers. Departing flights to Bangkok are served by Thai Airways International. Silk Air has flights from the island to Singapore, and Firefly Airlines serves Kuala Lumpur and Penang. Several ferries offer service between the island and mainland. Buses and taxis provide service to locations on the isle. Taxis charge passengers a flat rate, depending on the destination. 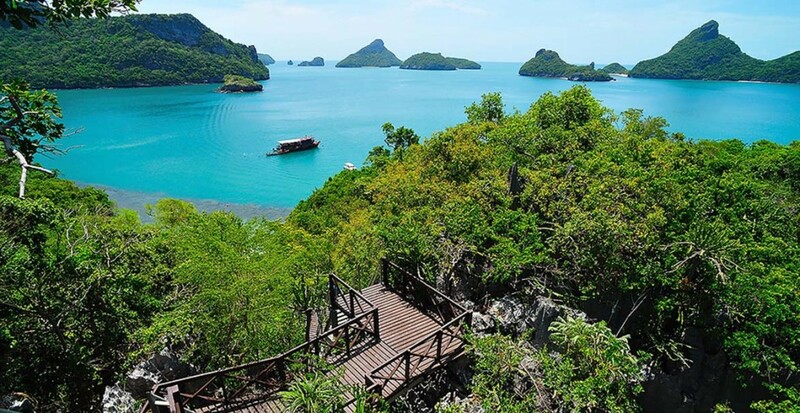 Ang Thong National Marine Park on the Gulf of Thailand is an environmental paradise situated on 42 islands. The park offers white, sandy beaches, massive limestone cliffs, tropical jungle, waterfalls, secluded lakes and coves, and mangroves. The protected region is the habitat of native wildlife species. Group tours and boat charters to the island are available. Activities to enjoy are scuba diving, snorkeling, hiking, sailing, and kayaking. The Big Buddha Temple is a massive shrine dedicated to Buddha with smaller shrines inside the main temple. The temple is accessible from the island by a causeway. The Buddha statue is situated in a courtyard where visitors may purchase religious items, artifacts, clothing, and souvenirs. The yard has food stalls and restaurants. When spotlights glow at night, the Buddha is a spectacular sight. Hin Lad Waterfall Temple known as the Saunthamma Pala Nikrotharam Temple, is in the evergreen forest, just outside Nathon Town and close to the scenic waterfall. The temple grounds have a beautiful garden, walking paths and a sense of tranquility. The monastery is a tourist attraction on weekends, but is usually quiet during the week, so it's a good time to visit and experience the relaxing ambiance. The Chinese Temple was built in 1862 and is one of the most colorful on the island. Two golden lions guard the main entrance of the temple. A garden in the courtyard is surrounded by high, stone walls that muffle the noise from the street and offers a peaceful atmosphere. The temple is a must-see attraction and is in the center of Nathon. To the northwest of Lamai Beach is the Secret Buddha Garden. The tranquil garden is in the midst of lush jungle in the island's interior and was created by Nim Thongsuk. He was a farmer who added more statues to his beautiful garden until he died when he was 91. The garden is almost a mystical place with surprises for first-time visitors. 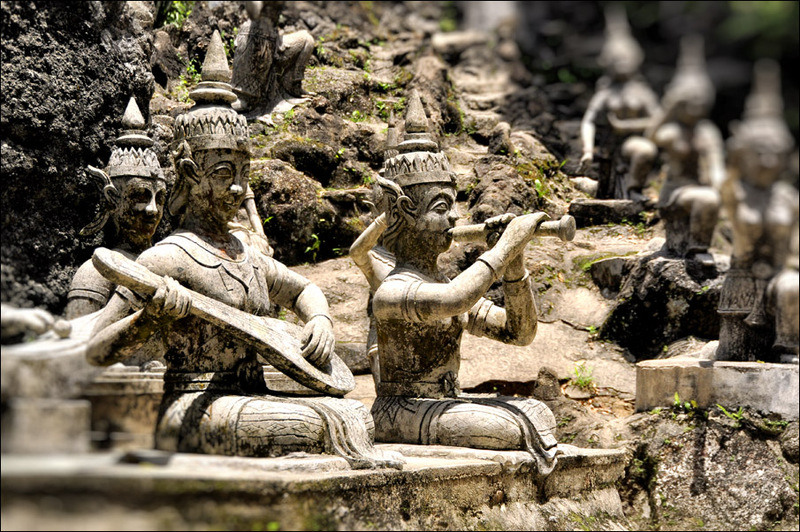 Each of the statues represents a figure from Buddhist folk tales. Full day tours are available. The Buffalo Fighting Festival takes place on New Year's Day and other cultural holidays. The event is harmless fun in spite of its name. Buffalo are decorated with colorful ribbons and leaves that are painted gold. Before the event, monks sprinkle the Buffalo with holy water. Two rounds are run, and the winner receives a large cash prize. Ten Stars Samui Art Party is held at various resorts and other venues around the island. The event is for local and international artists to display their original artwork. The focus of the event is on building the cultural community on the island. The Samui Regatta is an annual event which started in 2002. The race is famous in sailing circles worldwide. Competitors from as far away as Japan, Australia, China, and Singapore come together to participate in the tournament. The Midnight Run is an annual event that is becoming one of the premiere charity events in Thailand. Between 1000 and 2000 runners participate in the run in Chaweng Beach. Runners may participate in the 5 or 10 km race. The proceeds from the event benefit worthy causes including the Koh Samui School For Autistic Children and the Green Project. The Koh Samui Triathlon attracts local and international athletes each year to participate in the grueling competition that consists of cycling, running, and swimming. Only athletes who are in top condition can complete the competition that takes place every April. The cycling course is in Nathon while the run is between South Koh Samui and Nathon. All around Koh Samui are beautiful, sandy beaches, each of them unique. Lounging in the sun and swimming in the crystal water draw visitors for a holiday. The beaches offer activities for the adventurous including kitesurfing, scuba diving, and snorkeling. The beaches with the most visitors are on the eastern side of Koh Samui, while the west coast beaches are less developed and wilder. The southernmost portion of the beach has the widest strip of sand and is excellent for swimming. This section of the beach is near restaurants, bars, and shopping. If you want to avoid the area with a lot of the bars along the main street, the northern section of the beach is more isolated. The sea at the north part of the beach is very shallow until you get out quite a distance, so it's good for people who aren't strong swimmers. 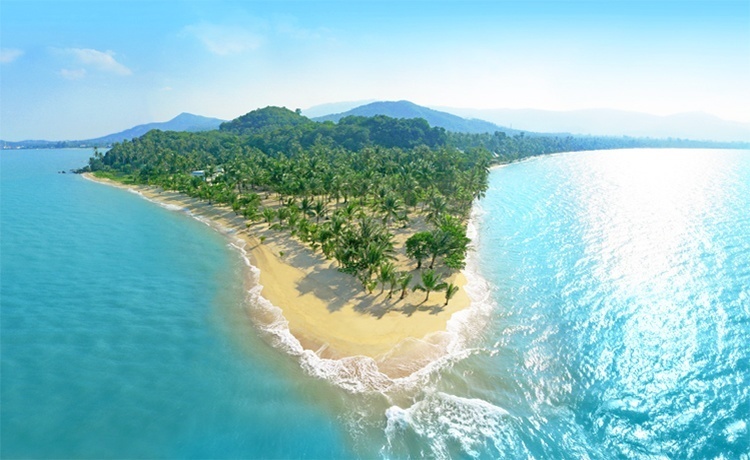 Chewang is the largest of the beaches on Koh Samui, has white sand and emerald water on the Gulf of Thailand. The beach is lined with coconut trees, offering protection from the sun. The central section of the beach is close to the nightlife venues and is bustling all the time. The beach offers beautiful, panoramic views. Shops and restaurants are close to the beach which is mainly accessible from the hotels and resorts. Lipa Noi is more remote than many of the other beaches, with a sandy beach and shallow water. The beach has a pleasant, quiet atmosphere and attracts an older class of visitors and locals. Several good seafood restaurants are near the waterfront.